23 September 2014, at 9:27a.m. 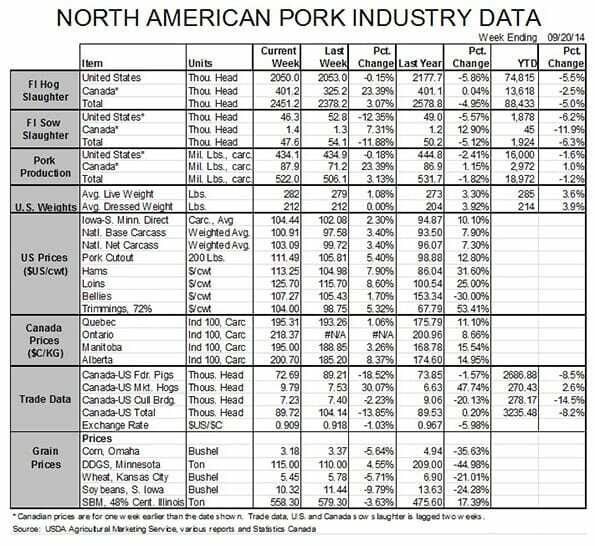 US - Pork and hog prices have been helped along this year by the supply situations of our major competitors. Part of that impact will endure but part of it is showing signs of waning. Let’s look at the other species this week, writes Steve Meyer for the National Hog farmer. Virtually every data item dealing with the number of beef cattle in the countryside is at its lowest level in 40, 50, 60 years – you can sort of pick the time period. These figures include the beef cow herd, the calf crop and the supply of cattle outside of feed yards. They are the result of very long-term trends that have been pushed along in recent years by severe drought conditions. Most significant among those were the 2011 drought in Texas and Oklahoma, traditional home to 25% to 30% of the nation’s beef cows, and the 2012 Midwestern drought that drove grain prices sharply higher and hit some pretty important cow-calf areas in the Northern Plains and Corn Belt. A key resource factor – range and pasture condition – is much better than just one year ago and is still improving. 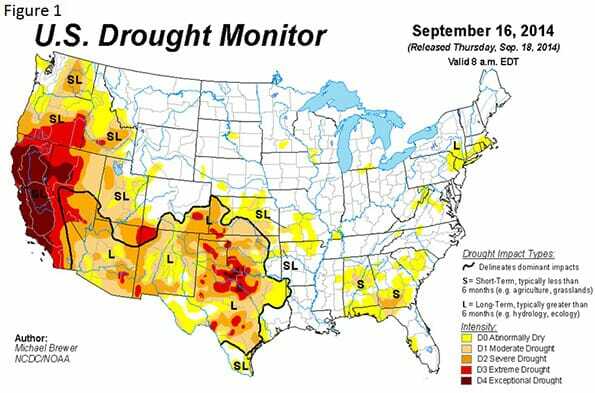 The National Weather Service’s Drought Monitor (see Figure 1) shows vastly improved moisture conditions in virtually the entire country east of California. 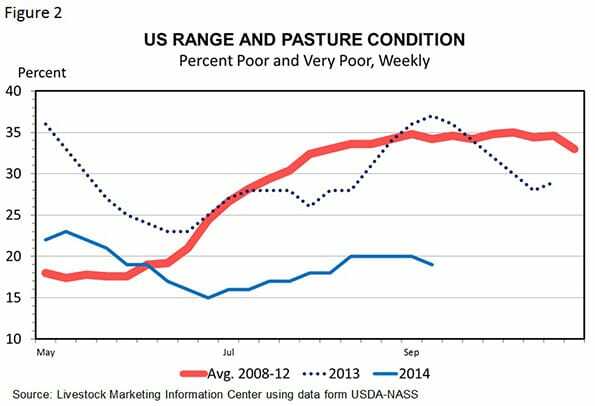 The U.S. Department of Agriculture’s weekly Crop Condition report shows that the percentage of pastures rated in poor or very poor condition is one half as large as one year ago (Figure 2). That same weekly survey shows that the percentage of pastures in good or excellent condition has improved from 36% one year ago to 50% last week. Better pastures and record profitability at the cow-calf level mean heifer retention. Those heifers will come from a record-small July 1 supply of feeder cattle outside of feedlots and the smallest calf crop since the early 1950s. My data set just goes back to 1960 and this will be the smallest calf crop in that time period. Bottom line: This calf and fed cattle supply will not grow much any time soon. Friday’s Cattle on Feed report suggests that fed cattle supplies over the next six months will stay extremely tight. Sept. 1 feedlot inventories were down 0.8% from one year ago. That’s not a large reduction but this marks the 25th straight month of year-on-year declines in the number of cattle in feedlots. We expect high beef prices at least through 2015 and, very likely, 2016. The broiler sector has had every reason to expand production and has encountered about every occurrence imaginable that would keep it from happening. Reduced genetic source flocks in 2012, fertilized hatching eggs to Mexico in 2013 (and even now), fat roosters, vaccine issues – you name it and it has been problematic. So much so that production this year will be virtually the same as last year when I expected it to be 3% to 4% higher. 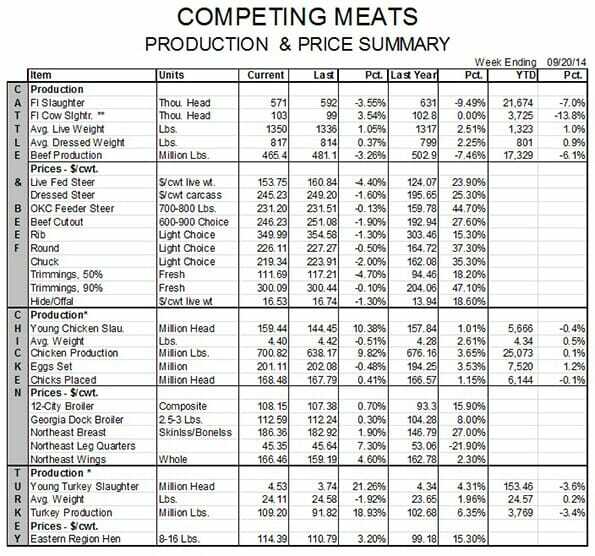 The “reduction versus expectations” has left chicken prices 8% to 10% higher than I had expected, providing a relative advantage to pork. There are signs of life from the broiler sector. Egg sets have exceeded year-ago levels by ever-growing percentages since July. That growth rate exceeded 3.5% in the weeks ending Sept. 6 and Sept. 13, the last weeks for which data are available. The broiler laying flock grew by more than 2%, year-on-year in both July and August. That’s not an aggressive rate but it is much higher than the fractional growth of the three previous months. There is talk in the industry that substantial growth is under way and significantly lower feed – and most notably soybean meal – prices will provide fuel for that growth fire. Turkey output is down 4% from one year ago and turkey companies have been quite profitable. Whole-bird prices are virtually unchanged but turkey cut prices, which are vastly more important to the sector except for the fourth quarter, have been sharply higher this year with some more than double their year-ago levels this past summer. We will likely see growth from the sector in 2016 but these companies have been remarkably disciplined so far in spite of lower production costs. Growth? Yes. Big growth? I doubt it. So, beef prices will likely remain high for the foreseeable future. Chicken prices are on their way down, making broilers and broiler products more competitive with pork. Turkey prices will likely fall but the decline will begin at such high levels and the industry has shown enough restraint that we don’t think turkey will get cheap by any means. From a competition standpoint, pork demand will likely not be damaged much in 2015. Let’s hope so.